Callistemon ‘Taree Pink’ is thought to be a cultivar of C. citrinus. ‘Taree Pink’ is a medium sized shrub that will reach a height of between two to three metres with a similar spread. The leaves are about five centimetres long by one centimetre wide with visible oil dots and a sharp point. New growth is soft and pink. The flowers are bright pink, ten centimetres long, three centimetres wide and appear in profusion in mid spring. Flowering extends into summer. The brushes are rich in nectar and attract honeyeaters and a range of insects. In our cold climate garden, ‘Taree Pink is one of the first spring flowering bottlebrushes to burst into bloom. Pruning is essential to keep plants dense and flowering profusely. Cut each branch behind spent brushes. This encourages new growth and promotes flowering. 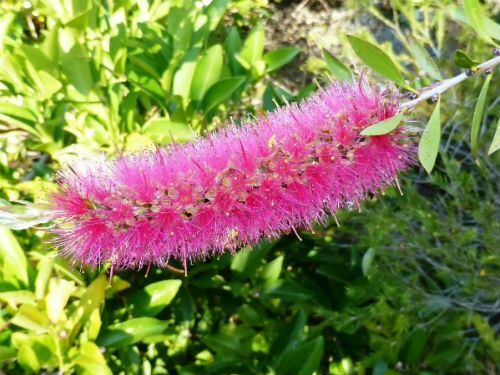 Callistemon ‘Taree Pink’ could be grown as a colourful hedge or screening plant. The cultivar could also be cultivated as a street tree under power lines.